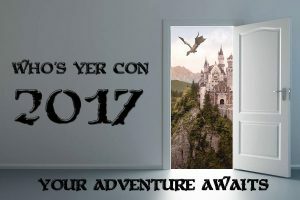 As I mentioned last week, Who’s Yer Con happened this past weekend! 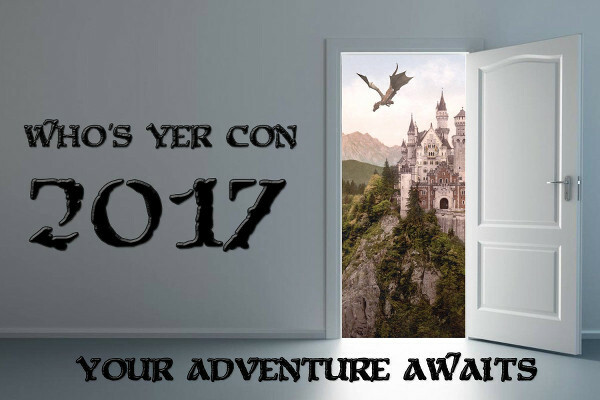 Who’s Yer Con, for those who are still not in the know, Who’s Yer Con is a three-day free gaming convention, put on by the local non-profit, Who’s Yer Gamers. It’s a weekend full of open gaming, the occasional panel, tournaments, and just general fun, friends, and fellowship. Also, six dollar chicken tenders at the cash-only concession area at the Wyndham. What can I say, they’re pretty filling, and they aren’t as greasy as pizza. Anyway, I stopped by after work on Friday to pick up my badge, which was the “member” badge that was available for $25, which is a very fair price to pay so others can enjoy a free convention! This got me a t-shirt, some packs of True Dungeon tokens (sadly, no ultra rares, or Golden Tickets that could have paid for some blog upgrades! ), a couple of games, and a music download, on top of a “Member” ribbon to go on my badge to show my support for the con (I love name badge ribbons!). While this was supposed to just be a real quick stop to run in, grab my stuff, then run out, it ended up taking a while as I talked to friends, talked to the DNA Games crew about their podcast last week, said hi to Rico with the Gaming with Scott podcast, and looked around the vendor room a bit before heading home. After a late night filled with too much sushi, I popped back in early, to catch the Indy PopCon panel, which involved a live taping of their “Con Job” video series. It was fun watching Carl bag on Jake for running late for the panel (with Jake’s family in the audience, no less! ), watching a group of attendees play a game of “Password” on the recording (including Rachel from The Five(ish) Fangirls Podcast! ), and hearing information on what it’s like to run a convention in a very crowded and competitive market, and why it’s important to support other local shows. This was followed by another panel, called “Podcasting 101” which featured the aforementioned Rachel, joined by Brandon from the Cult Cinema Cavalcade Podcast and Matt from The Nerd’s Domain Podcast. They went over a lot of really good information for new podcasters, with the underlying message being, “Don’t worry about the details. Just start recording. Everything else will just happen.” No, that’s not an actual quote, it just seemed to be the best way to put that thought across. After the panels, the rest of the day was going to involve checking out some games I’ve really been wanting to try, like Star Trek: Ascendancy, Harry Potter: Hogwarts Battle, or the Battlestar Galactica board game. Instead, it was filled with friends. So many friends, both old and new. I lost track, to be honest. I was able to meet many of the folks I’ve only known on social media, I was able to meet people who run various aspects of the convention, I was able to talk to friends I mainly only see at conventions, even if only for a few minutes. In fact, over the course of the entire convention, not once did I play a game. I did, however, get a chance to check out some cool stuff from Geeks 1st, and I’m going to be reaching out and talking more with this local company in the next month or so. I also have a feeling that I might end up doing more with Who’s Yer Con, and Who’s Yer Gamers, in the future, so that is pretty cool. To everyone who worked their butts off to bring us another fantastic, locally-run convention, thank you! My fez is off to Who’s Yer Gamers, their volunteers, the vendors, and everyone who made this a fantastic weekend for all involved! Keep your eyes peels for the 2018 date, because this really isn’t an event you want to miss! Props to Rachel for reminding me the 2018 dates were in the program (I gave mine to an attendee who didn’t have one, and needed one)! Mark your calendars for March 30th – April 1st, 2018, because you don’t want to miss this show!